September 30, 2010 – The biggest difference between the Halloweens of my childhood and the Halloweens of my adulthood (besides the fact that back then Star Wars costumes came with a lot less baggage) is the Internet. Besides forcing me to capitalize words I don't really think should be capitalized, it has made the entire world more accessible, including Halloween. That means no longer do I have to rely on television schedules, the Halloween inventory at local stores, or the weather to conjure up the Halloween spirit. It's online anytime I want to access it. What medium can promise that (SWIDT)? So here are 25 links to news, articles, and activities to help put you in the Halloween mood, just in case the fact that it's October tomorrow doesn't do that by itself. 1. 50 Years of Psycho collectibles. 2. NBC to resurrect The Munsters. 3. Generel Mills monster cereals back for a limited time. Still not sure why they keep insisting on box art that features super-close-ups of the monsters' faces. Definitely way cooler things they can do. 4. 1980s-era Canned Ghost, courtesy of the Ghostbusters marketing team. 5. Scared Shrekless airs on October 28. Hate Shrek. Like Halloween versions of non-Halloween properties. 6. How to make Dexter-inspired candy blood slides. 7. Rob Zombie to be on the Halloween episode of Extreme Makeover to help design a haunted house attraction for a deaf school fundraiser. Zombie quote: "It was a rare opportunity to put some evil to good use." 8. The trailor for the SyFy channel's 31 days of Halloween, which is better to watched compressed into 15 seconds than sitting through the actual programming. Was that Traci Morgan? 9. A firsthand recap of the 2010 Eyegore Awards, featuring Christopher Lloyd, Corey Feldman, and Sid Haig. 10. The schedule of October events for Sleepy Hollow, NY. 11. 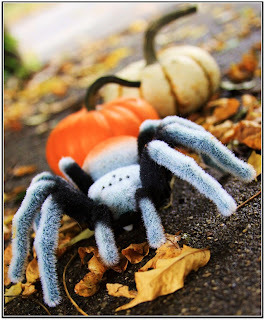 Pumpkinrot...probably the best Halloween blog out there. Actually, I'm going to take back that "probably." 12. The Turner Classic Movies blog offers the 1945 film, The Woman Who Came Back, as a suggestion for your Halloween enjoyment. 13. Elvira is back on TV. Because HD widescreen format was made for her. 14. Halloween is now bigger than Valentine's Day in the UK. Still gunning for Christmas. Best quote: "Halloween, considered by some to be a vulgar American import..."
15. ABC Family's "13 Nights of Halloween" is on for its 12th year. Includes schedule, which, looking through it, makes me long for the days when this channel was the Fox Family channel. 16. Ten major jack-o-lantern festivals. Check out the pic attribution for #5. 17. Haunted attractions across the country. 18. Horror movies headed for theaters this October. 19. Doc Mock's MonsterTime, a Halloween Flash game based on BurgerTime, except instead of building burgers, you're building classic Universal monsters, and instead of running from condiments, you're running from 1980s-era slasher villains. Will probably use up half my Halloween on this game. 20. Read about the "Halloween Capital of the World" and be surprised that it's Anoka, MN. 21. Latest live-action Scooby Doo movie debuts October 16. Will watch, but am digging the new cartoon series incarnation, Scooby Doo: Mystery Incorporated, more. 22. An Orlando Sentinal columnist reviews this year's Halloween Horror Nights at Universal Studios Orlando. 23. Atari re-releases its 30-year-old classic Haunted House with updated graphics for Windows PC. 24. The schedule of Haunted Happenings in Salem, MA. 25. McDonald's will be offering Mr. Potato Head Halloween pails this Halloween season. I've only ever used the word "pails" in the phrase "McDonald's Halloween pails." Number 18's link gives a 404 Not Found.